Mote Marine Laboratory scientists in Southwest Florida and others along Florida's Gulf Coast are closely monitoring counts of red tide algae, after noting low-level increases of these algae cells in multiple seawater samples during the past two weeks. 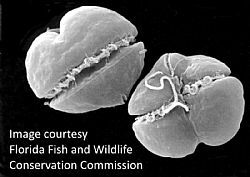 Karenia brevis, the single-celled, harmful algae that causes Florida red tide, occurs naturally in background concentrations in the Gulf. Recently, some samples in Southwest Florida and the Panhandle have revealed “low” or “very low” counts of K. brevis, which are greater than the normal “background” levels. (See below). Algae are a valuable part of marine ecosystems, producing half of the oxygen we breathe and providing food for marine wildlife. However, harmful algae can be a nuisance or even a health concern. When K. brevis algae cells accumulate in high abundances, their toxins may affect marine life and people. These toxins can enter the air and cause respiratory irritation among beachgoers, such as coughing, sneezing or a scratchy throat. These symptoms are temporary and often considered an annoyance, but people with asthma, COPD or other chronic respiratory conditions should avoid areas with red tide algae, since the toxins can trigger their symptoms. Low or very low concentrations of the organism may cause respiratory irritation, particularly if winds blow onshore. Low concentrations also can kill fish. Many factors, including algae distribution, currents and winds, can determine whether the effects are noticeable.